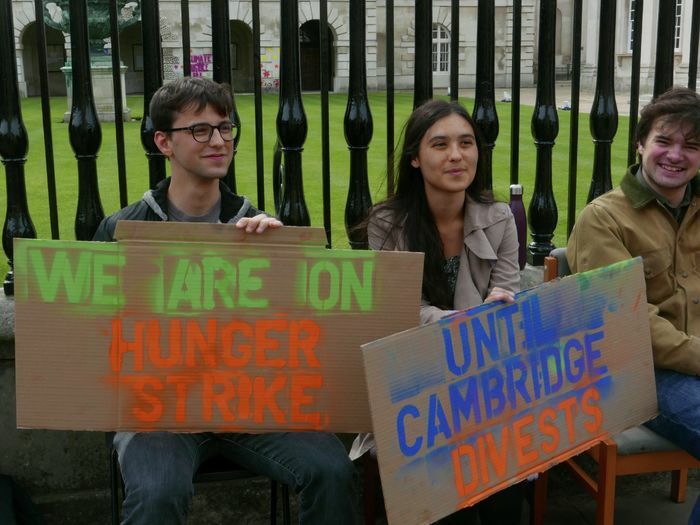 Three students from Cambridge Zero Carbon Society, including myself, have been on hunger strike for the past four days – an escalation of direct action in the run-up to the University Council’s decision on divestment from fossil fuels on Monday. The case for divestment is plain, unequivocal, and overwhelming, and has been accepted and endorsed by both the student and the academic bodies of the university. The investment of some of Cambridge’s £6.3bn endowment in companies responsible for the destruction of the earth is both illogical and morally indefensible, and there is no longer any serious question over the necessity of divesting from fossil fuels: either we do, or we find ourselves on the wrong side of history – and time is running out. Some people, even avowed leftists, have suggested to me that hunger striking is precisely the type of ego adventure typical of the student activist who is arrogant enough to think they have the power to change things and the right to demand such change. I do not accept this premise. Students have limited power, certainly, but here – in the wealthiest university in the UK and one of the most prestigious academic institutions on the planet – we are in a position of significant power relative to many people in the world, especially those in the global south facing the greatest risks from climate change. Every student at Cambridge has at least the amount of power afforded to a student at Cambridge. Whether one chooses to try and exercise this power for the cause of justice, for the cause of one’s career, or not at all, is up to each individual. There are others who, deriding any attempt by students to engage in politics, spend so much time looking for ‘real politics’ that they miss it when it is under their noses. To these cynics, I would say that the politics of Zero Carbon Society is based on a straightforward concrete analysis of the concrete situation: Cambridge University currently invests in fossil fuel companies; this situation is unacceptable; it is therefore necessary for us to do whatever is in our power to put an end to it. After the exhaustion of all democratic channels, we have had no choice but to turn to direct action. The most serious direct action available to us is a hunger strike. We have made and continue to make the ethical and financial case to the University, but we must show management that if they continue to ignore reality, we will not allow business as usual to go on at Cambridge. Even if you disagree with our tactics but support divestment, we strongly encourage you to email the vice-chancellor and University councillors urging them to commit to divestment. It is all well and good to wax lyrical about the ‘rational debate’ we already spend so much of our time engaging in, but it does not advance democracy by one inch if nothing else is done to ensure that those injustices that are taking place in our own communities are put to an end. Whoever does nothing, says nothing about the billions of people whose lives have been, are being, and will be destroyed by the activities of the fossil fuel companies in which our University invests discredits themselves with regard to democracy. It has been put to me that the tactic of the hunger strike is offensive to those suffering from real hunger around the world. I think that this is a drastic misunderstanding of the nature of hunger striking. It is by no means meant as a kind of pantomime imitation of the hunger faced by so much of the world’s population. It instead represents the political protest relocated to the most intimate location available, the body of the protester. If the University will go so far as to ignore the health of its students, then they are really saying that they are more interested in a return on their investments than in the wellbeing of the students they are responsible for. Nor do we see those bearing the brunt of a global system that inflicts death, disease and destruction as mere passive victims, waiting for the miraculous intervention of white saviours. Instead we see them as political subjects who have been disenfranchised by large-scale imperialist and colonialist projects undertaken by corporations and the states in thrall to them. Such subjects include the Ogoni people of Nigeria’s Niger Delta, an oil-rich region that has suffered extensive environmental damage as a result of Shell’s activities. Last week, the Movement for the Survival of the Ogoni People sent a letter to the University of Cambridge, urging it to divest from fossil fuels, which cause pollution that has been linked to a spike in infant mortality. The movement’s founder, Ken Saro-Wiwa, was hanged by the Nigerian government in 1995, an atrocity for which the Ogoni people hold Shell responsible. Shell eventually paid more than $15 million to Saro-Wiwa’s family and other Ogonis to end a legal battle. Our actions are nothing in comparison with the life-and-death risks Saro-Wiwa took, and that activists all over the world continue to take. But we can, and we must, give power to our politics. This is not state power. It is not institutional power. However, it is a very real power, both with regard to ourselves and to certain situations. Divestment is one of those situations that calls on us to use every inch of our power, and every inch of our personal capacity, to fight for justice. I invite you all to join us at the rally outside Senate House on Monday 21st May at 9:30am. We will win, today or tomorrow.